While waiting for disasters to come due to the January 15, 2015 visit of Pope Francis to the Philippines, let’s discuss the proposition that fictitious Jesus, who is being used by the Pope and his Christian cohorts as Christ and God, had originated from the ‘biblical letter ‘J” that kills’ being referred in 2 Corinthians 3:6. The issue is worth delving into because firstly-there are substantial differences in the English translations of the verse, which also mean that translators can effectively kill the spirit of the words in their respective version. Secondly-the development of the name ‘Jesus’ is intimately connected to the evolution of letter ‘J’ in the English alphabet, which letter evolved into existence only about 500 years ago, without which, the name would had never existed and may still be Ἰησοῦς (Iēsous) until now, if the alleged Greek translation was sustained. 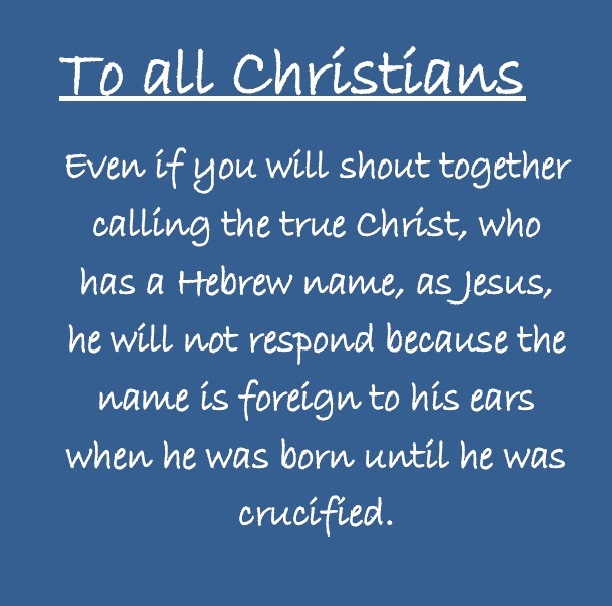 In short, the letter ‘J’, which can be used as a barometer to identify this biblical ‘letter that kills’, was instrumental in the development of the name ‘Jesus‘ in Jesus Christ. In fact, it is the only name that has this peculiar historical character and background. That being so, the Letter ‘J’ in Jesus Christ’ can be specifically denominated as the ‘letter that kills‘ and consequently, Jesus Christ per se and the Christian bible itself, can be denominated as “the written text that brings death“, as a whole. Thirdly, based on the above premises, a conclusion may be drawn that 2 Corinthians 3:6 is actually referring to a fictitious name rather than related to the Commandments of God. The presentations in this issue consist of series of four articles. This is to facilitate the easy understanding and intended not to over-burden the readers, considering the point in issue is expected to be somewhat complicated to deceived believers. 4And such trust have we through Christ to God-ward: 5 Not that we are sufficient of ourselves to think any thing as of ourselves; but our sufficiency is of God; 6 Who also hath made us able ministers of the new testament; not of the letter, but of the spirit: for the letter killeth, but the spirit giveth life. 4 And such confidence have we through Christ to God-ward:5 not that we are sufficient of ourselves, to account anything as from ourselves; but our sufficiency is from God;6 who also made us sufficient as ministers of a new covenant; not of the letter, but of the spirit: for the letter killeth, but the spirit giveth life. 4 We dare to say these good things about ourselves only because of our great trust in God through Christ, that he will help us to be true to what we say, 5 and not because we think we can do anything of lasting value by ourselves. Our only power and success comes from God. 6 He is the one who has helped us tell others about his new agreement to save them. We do not tell them that they must obey every law of God or die; but we tell them there is life for them from the Holy Spirit. The old way, trying to be saved by keeping the Ten Commandments, ends in death; in the new way, the Holy Spirit gives them life. 4 Such is the confidence that we have in God through the Messiah. [a] 5 By ourselves we are not qualified to claim that anything comes from us. Rather, our credentials come from God, 6 who has also qualified us to be ministers of a new covenant, which is not written but spiritual, because the written text[b] brings death, but the Spirit gives life. After reviewing the said translations, the publisher is inviting the readers to note for themselves, whether or not the way that ends in death is related to the Ten Commandments of God, by reading the next article entitled: Second part of ‘J’ is the letter that kills‘. As a preparatory task, kindly decide before reading the next article, whether or not the the answer to the above issue is in the affirmative. By aaphil in Religious Deception, The Word on January 17, 2015 .